The team at Grant Boilers are very conscious about green performance. Hence why they always have at least one-eye on emerging technologies that can allow us to heat our homes cheaper, whilst also using renewable energies where we can. 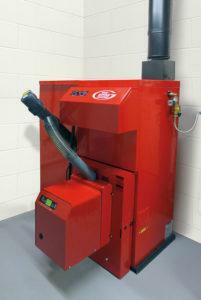 One such exciting product offered by Grant is the Spira Wood Pellet Boiler range. Fuelled by wood pellets, the boilers are environmentally friendly, and a convenient way of providing heat for your home. The units come complete with a 110kg pellet store/hopper and feed auger. Depending on your requirements, the range is available in outputs of 6-26kW with an efficiency of 97.4% gross, and 9-36kW with an efficiency of 93.1% gross. Recently awarded accreditation under the Microgeneration Certificate Scheme (MCS), end users are now eligible to benefit from the Renewable Heat Premium Payment (RHPP). In addition, once the domestic side of the Renewable Heat Incentive (RHI) scheme is launched, consumers will also be able to register to receive payments for generating their own renewable heating. Grant Spira Condensing Wood Pellet Boilers were named Best Renewable Energy Product 2011 by the Sustainable Energy Authority of Ireland.